What a productive week! After telling multiple newspapers that I had no intention of writing an essay collection ever again, I found a way to write another essay collection: make it fun again. 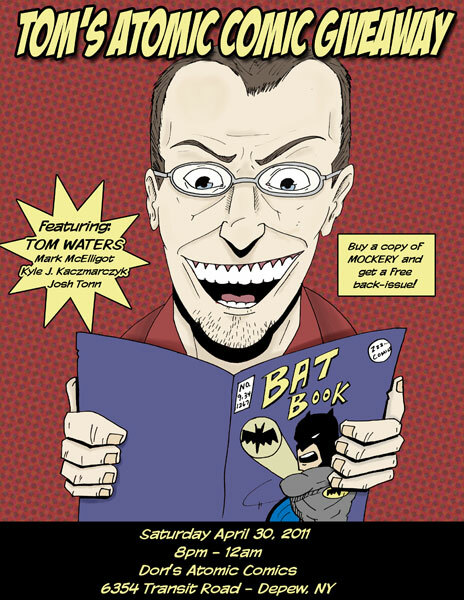 Unlike any book I’ve written to date, it started with the title: Travesty. My goal is to make every piece live up to the title of the book and to make sure that every single rant is shorter, funnier and more offensive than anything I’ve written to date. I also set a few ground rules: nothing longer than three pages, every rant has to be written in one sitting and I can’t cover a topic I’ve covered so far. I started last week with one rant about the supposed Rapture and haven’t stopped. One third of the book is already done. The only problem is that I have no idea when to release it. Doubt It Publishing has a full dance card for the next two years, so I may have to piggyback it with the numbered hardcover release for Icarus On The Mend in the fall of 2012 and I’m leaning strongly towards that. Pre-production on Poke The Scorpion With A Sharp Stick (my third collection of poetry) is progressing at a rate that’s astonishing and well ahead of schedule. Brian Platter (the graphic designer behind Six Shot Studios) has taken the bull by the horns and he’s tackled the book head on with a bold look, some daring choices for the title and content fonts and a beautiful presentation where the headers and footers are concerned. For those of you who were trusting enough to make the leap along with me where Breathing Room Volume I and II were concerned, you won’t be disappointed. The content has evolved since the original two poetry books to the point where I’m no longer aping my own heroes and I’ve developed my own voice where poems are concerned. While it’s not necessarily a jumping off point, it is a progression, so we’re working overtime to create a size format that bridges the jump between Breathing Room Volume I and II. If you buy this book this fall, you’ll be pleasantly surprised with the growth. Two major national literary magazines (The Chiron Review and Chronogram) have already gotten on board with three different poems that they’ll be publishing in short order. I devoted a week to submitting the content to the top poetry trades in the country along with putting the final touches on the manuscript and it’s already paying off. While poetry books don’t pay off as well as my rant collections, it’s a labor of love and something I would do whether I turned a profit or not. This new book means a lot to me and Six Shot Studios is doing a spectacular job on the appearance. Expect the specialty format this fall by the time Mark McElligott and I get very serious about touring on a regional scale. 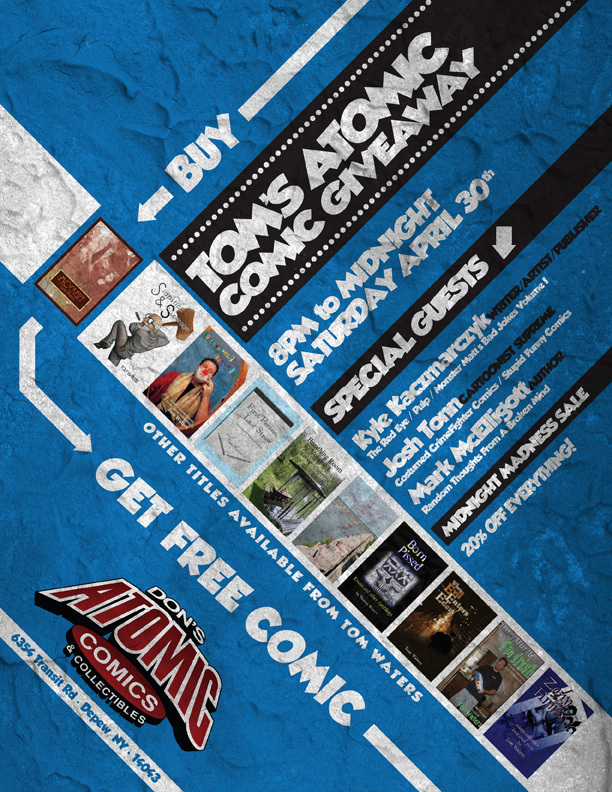 Tom kicks off a comic book promotion at Don’s Atomic Comices with a star studded cast of special guests including Carrie & Ron Gardner, Monster Matt, Terry Kimmel, John Kindelan, Michael Hoffert Jr. and Brian Platter. Newcomer Brian Bogucki gets blindsided while Mark McElligott rolls with the punches. Tom closes out an evening of hilarity and insanity by getting a few more cheap shots in at Terry Kimmel’s expense and dropping a few promotional plugs for once. -You can also conveniently subscribe to the show for free on iTunes by searching ‘Big Words Radio’ under the Podcast section as well as the Comedy listing. The Literature category is a dead link that is no longer active, so please subscribe and the entire library will be at your command! May was a horrible month for the show in terms of downloads and requests, so I implore you to visit the sites or subscribe to the show. Without a noticeable increase in traffic I see no reason to keep devoting so much time to working on pre-show prep, research, questions, guests, recording time, production and posting time. If you enjoy the show, please tell your friends, spread the word and download at will. Big Words Radio has been booming since September of 2010 and it’s crushing to see the latest numbers. For a show production that costs me so much in man hours without collecting any monetary revenue, I could really use your help. Download, listen and tell your friends. Unlike some other podcast hosts, I don’t cook my numbers. Despite some recent turbulence that has zero bearing on this month’s numbers, I would really appreciate your ears (and your feedback) on the show. I’ve spent four years slaving away on a free hobby and it would mean a lot to me if you pitched in and clicked a link or shared the show with the people you know. All I ask for is a spreading contagion on my stats by the end of June. Please help me out. Mockery is selling better and faster than any book that preceded it, so thank you so much for that. Every appearance has been positive and the book is breaking down barriers heretofore unheard of. You have no idea how grateful I am for all of the people who have come on board and spread the word about my work and my book. Three people in the same week commented or asked about the level of my output lately (a lot) and I wish I had an answer for all of you. I’m in a good place. The big picture is clicking comfortably into a lifestyle that leads me to bigger and better things along with the ability to write more and publish more often. Things will only get better from here. Doubt It Publishing is not a short term subsidy house or a slash and burn print on demand concept, it’s quickly becoming a reality. I’m going to have to make a hard decision in November when it comes around to picking a new Author Of The Year to work with. At the risk of sounding insincere or faux-humble, here’s what’s always guided and informed me: William Carlos Williams. He was a popular poet, a family man and a practicing physician. After a full overtime shift and an appropriate amount of time eating dinner and tucking his kids into bed and spending time with his wife, he added some hours to his waking existence to writing poems. I’m an artist from Buffalo. This is the only option that any of us have for expressing ourselves. If your work means that much to you, make the time for it. That’s it. None of us are busier than William Carlos Williams was, so what’s your excuse? If what you have to say and want to say is important, you’ll find a way to express it and make the time to do it above and beyond every other responsibility that you have. I’m nobody special. Writing is the way that I cope with a world that I can’t grasp or deal with without figuring it out on paper. None of us are heroes or gods or legends and the majority of us do it because we need to. Otherwise we’d lose our minds without the outlet. All of this is work. All of this is important and vital and crucial to me. Whether it’s a mountain or a mole hill, this is what keeps me relatively sane. Thank you so much for making it a lucrative side business. In another ten years, I hope to make it a career. Please help me work towards it.